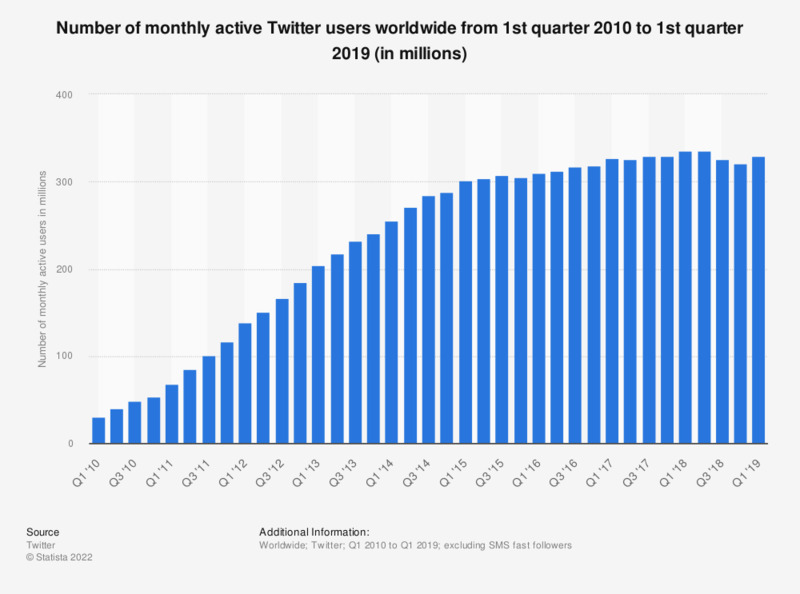 This statistic shows a timeline with the amount of monthly active Twitter users worldwide. As of the fourth quarter of 2018, the micro-blogging service averaged at 321 million monthly active users. Twitter is a social networking and microblogging service, enabling registered users to read and post short messages, so-called tweets. Twitter messages are limited to 280 characters and users are also able to upload photos or short videos. Tweets are posted to a publicly available profile or can be sent as direct messages to other users. Twitter is one of the most popular social networks worldwide. Part of the appeal is the ability of users to follow any other user with a public profile, enabling users to interact with celebrities who regularly post on the social media site. Currently, the most-followed person on Twitter is singer Katy Perry with more than 108 million followers. Twitter has also become an important communications channel for governments and heads of state - former US President Barack Obama claimed a runaway first place in terms of Twitter followers, with Indian Prime Minister Narendra Modi and Turkey's President Recep Tayyip Erdoğan ranking second and third, respectively. In light of global e-government service growth, this is hardly surprising. Despite a steady revenue growth - the company's 2018 revenue amounted to 3 billion U.S. dollars, up from 2.44 billion in the preceding fiscal year. In 2018, it's annual net income amounted to 1.2 billion U.S. dollars - the company's first positive annual net income ever.